By joining the Legislative Forum you will have priority access to your very own free-market "think tank" that will be able to provide you with policy analysis, research materials, expert testimony, and much more! The Emerging Issues Forum brings together elected officials, policy analysts, and government affairs professionals from across the country to explore emerging issues in state public policy in the areas of energy, the economy, education, and health care. Our full-time government relations team and more than 200 experts are ready to assist with all of your policy needs. We offer on-demand policy analysis, the best free-market research materials, expert testimony, educational policy events, and much more. The Heartland Institute strives to be the first place a busy legislator or staff turns to for reliable research and commentary on the major issues of the day. The mission of the government relations department is to spread free-market solutions to each state by becoming the “go-to resource” for state elected officials. Our goal is to help educate state lawmakers about what they can learn from the policy successes and failures from other states. What makes Heartland unique among think tanks is that we are a national organization focusing on state level policy solutions for all 50 states. Heartland’s government relations team aims to respond immediately to requests for research and expert opinion. Last year, Heartland experts produced 146 policy documents and testified 18 times in 11 states. Another unique feature is our full-time government relations team which is ready and willing to help you with any of your public policy needs. We can send an expert to your state to testify; host an educational event in your state; or provide you research from the top experts in the country on a wide variety of policy issues. If you have any questions, contact us at 312/377-4000 or email us at governmentrelations@heartland.org. A weekly e-newsletter highlighting public policy trends at the state level as well as work from The Heartland Institute. This booklet explores solutions to the top public policy issues facing the states in 2018 and beyond in the areas of budget and tax, education, energy and environment, health care, and constitutional reform. The Heartland Institute produces Research & Commentary collections on a wide range of topics. Each R&C consists of a one- or two-page essay on an important public policy issue, followed by links to the best available research. R&Cs often are created on short notice following a request from a policymaker and then sent to elected officials in a single state or nationally, depending on the topic. 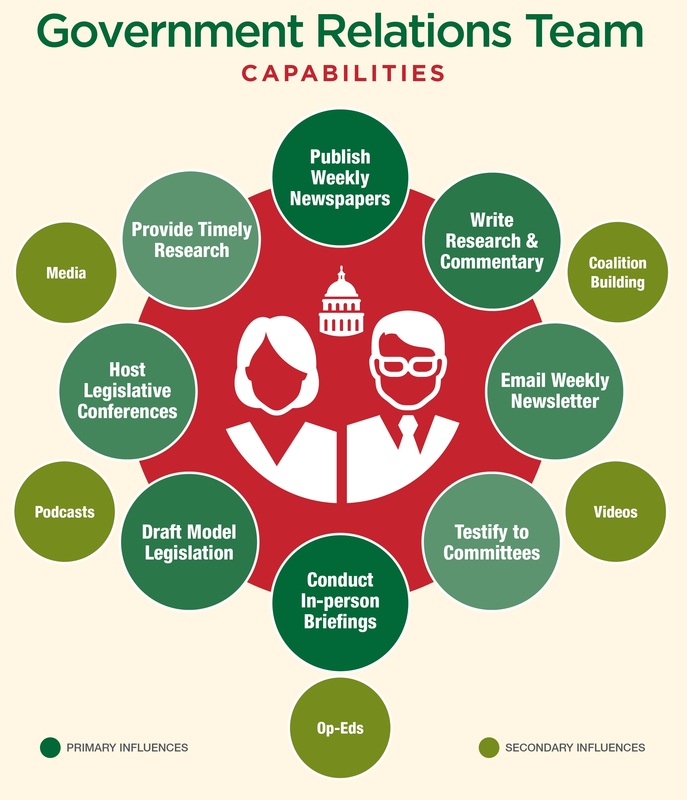 Our team of seasoned government relations professionals can help with research, legislative testimony, and more. Don't hesitate to contact us! "In a country whose political dialogue has been clouded with the lack of transparency created by conventional political thinking Heartland throws open the door to fresh and creative thought and discussion.